- After you’ve seen High Rise and H2 to Ticonderoga, head back to Railroad HQ to finish Boston After Dark. Carrington will drop Butcher’s Bill in your lap pretty much immediately. - This quest again has you looking for a dead drop for the Railroad in the form of mailboxes on the streets of Boston. Unlike Boston After Dark, this dead drop is randomized, so there’s no telling where you’ll be sent until the waypoint appears on your map. Expect trouble no matter where you go. - Upon grabbing the Augusta Report Holotape, play it on your Pip-Boy to discover the location of the safe house you need to check. 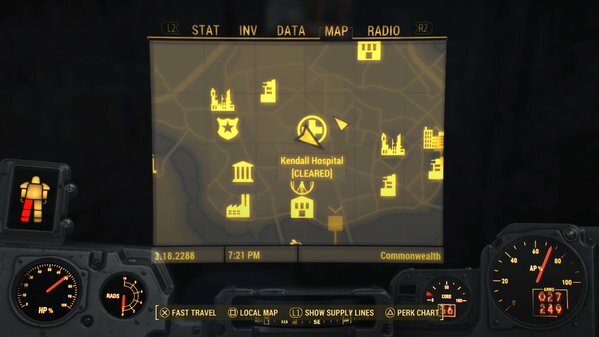 This will send you to Kendall Hospital, located in northern Boston, just north of the C.I.T. Ruins. Kendall Hospital in Fallout 4. The place has seen better days. - Kendall Hospital’s front door is a nasty place. If you fast travel directly here you’ll almost certainly draw Bloodbugs, Bloatflies, and Ghouls to you, the latter of which will flood to you from the graveyard in front of Union’s Hope Cathedral. Wiser is fast travelling somewhere nearby and then sneaking in. At least that way you can mitigate the damage rather than being swarmed from all sides. - There’s a large waiting room through the next unobstructed door, and several Raiders are waiting inside. A gunfight is likely, as the room is well-lit and it can be difficult to sneak around effectively. (Though if you are careful you can find a Protectron unit in the southeast that will effectively distract the Raiders.) Aside from a Turret in a window above your head on the second floor, however, it’s not too tricky a room to clear. There’s a Weapons Workbench and a Book Return Machine crammed full of crap in here, and in the northern store, behind the counter, you can find an Advanced floor safe. - A stairwell in the northeast will take you to the second floor. If you were quiet, you’ll find at least one Raider and a Turret up here. Aside from a heap of Railroad Agent bodies and some crafting items, though, there’s only junk on the second floor. Hop on the elevator. - You’ll wind up on the sixth floor. After a left and a right you’ll hit a hole in the floor, and on the other side is a Turret. Wipe it out. There’s little of use on the sixth floor, so go down through the hole and proceed until you see a bathroom stall on your left. Raiders are upcoming, so be ready for trouble. The next few rooms are connected, and aside from some easy battles there’s little to see. 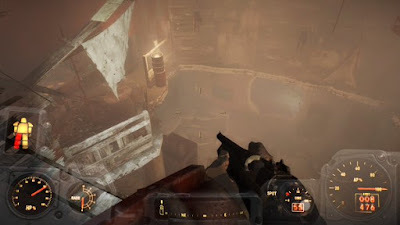 - You’ll see a fire-lit room after some walking, and you’ll emerge into a multi-level base for the Raiders, carved through the middle of the Hospital. There’s a Raider directly opposite this hole in the wall who will fire missiles at you if he spots you. Try to snipe him quickly, or at least fake him out a few times until he runs out of missiles. The trip can be made a bit faster via a blue door on your right if you have some Advanced door unlocking skills, but ignoring this is fine too. - There’s a bunch of ammo and assorted junk on the upper levels, but you’re ultimately interested in an office two floors down from where you came in. (If you want to find it really quickly, take a right from the entrance, go down the first ramp you see, go around the left side of the ramp, and drop. The office is behind you.) Sitting on the desk in the office is Augusta Station Last Update, the document you came to get. - … where, after a short jump that prevents you from going back to the higher levels, you’ll face a Deathclaw! Nice. You’re penned into a relatively small arena, making this an awkward battle, but you still have plenty of room to move around thanks to two connected holes in the northern walls. Through the northwestern hole you’ll find a door you can pop open with a button, which is where you need to go whether you kill the Deathclaw or not - though in order to make the button work you have to trigger a circuit breaker in the southeast, which can hamper your escape a bit. Check the generator near the door for a Fusion Core. - Beyond the security door is a hallway. Check the room on your right for a chest full of ammo and a Caps Stash, then head up the stairs on your far left to safety. Once you’re outside again, hop back to Carrington at Railroad HQ for your reward. (The amount of caps received didn’t show up on the screen for me, so… your guess is as good as mine how many you get for completing the quest.) Carrington will then give you a new quest, Butcher's Bill 2. If he doesn't give it to you immediately, leave and reenter Railroad HQ a few times, or have a nap. He'll toss it out eventually.